he Michigan Film Office was formed in 1979 to "assist and attract incoming production companies in the entertainment industry, including film, TV and music." Historically, Michigan has seen some degree of movie production, though nowhere near the magnitude of long-time production meccas California and New York. The Michigan Film Office reports that 127 films (or portions of films) were produced in the state between 1946 and 2007 — about two films per year. Michigan's first film industry tax incentives were enacted in a legislative lame duck session of 2006. The incentives granted a graduated tax rebate of up to 20 percent of a film or commercial production company's spending if the company spent between $200,000 and $10 million in Michigan. The smaller the film company's in-state spending, the smaller the rebate the company received from the state. Under that state financial incentive, three movies were filmed in Michigan in 2007. Claiming a need to increase the tax incentives in order to better compete with other states and create jobs, legislators passed a package of 15 bills in 2008. The most significant portion of the legislation amended the Michigan business tax law to allow film production companies to earn tax credits of up to 42 percent of the companies' spending in Michigan. The credits were refundable, meaning that the state issues the company a check for the difference if the company's Michigan-related spending exceeds its tax liability. These payouts currently have no limit. There are further tax credits for infrastructure spending and workforce training. The bills also transferred the MFO to the Michigan Strategic Fund from the Department of History, Arts and Libraries. The legislation passed with only one state legislator voting against it, and it was signed into law by Gov. Granholm on April 7, 2008. In a press release, she announced, "We're going to grow this industry and in the process, grow our economy and create jobs." The signing quickly drew media and public attention, as did the number of scripts and film incentive application submissions reported by the Michigan Film Office. The Muskegon Chronicle reported, "In 2008, the Michigan Film Office received 221 scripts for consideration, leading to 136 applications and 71 approvals for the incentive program in the nine months after the legislation passed." Because the Film Incentive's tax credits are refundable, the program's cost is substantial. 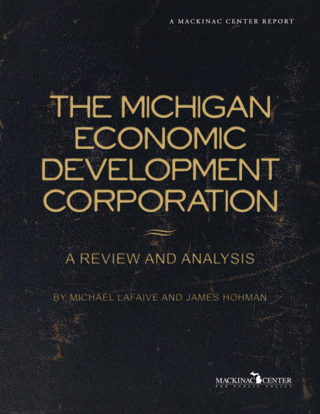 In May 2008, a Michigan Senate Fiscal Agency memorandum cited the state's Consensus Revenue Estimating Conference in warning that, "[T]he film tax credits will cost the State far more in business tax credits than it is expected to gain in income and sales tax revenue." The memo also stated, "According to the projections, if a film production company spent $10.0 million in Michigan, the State will gain less than $700,000 in income and sales tax revenue but will pay out about $4.0 million to the production company in the form of MBT credits." The SFA also predicted that based on the number of applications approved for the Film Incentive, the state would grant an estimated $148.8 million in tax credits to movie companies in 2008, compared to $98.8 million in expected tax revenue. Such estimates were critical not only for state budgeting purposes, but for evaluating the effects of the program. Aside from the immediate economic benefits of the film spending, this would include the potential cost of wealth transfers from Michigan taxpayers to film companies, since the money for the refunds comes out of the state's general fund. These wealth transfers were potentially significant. Given the basis on which the MBT is calculated, a film production company's business tax liabilities could be quite small, especially if the film company is not based in Michigan. But determining the amount of money that would be spent was initially difficult. At varying times throughout 2008, officials with the Michigan Film Office suggested tax refund estimates ranging from $20 million to $100 million. In an online video in January 2009, Mackinac Center Communications Specialist Kathy Hoekstra chronicled her difficulty in obtaining spending and tax credit amounts for each movie from the Film Office, and she noted that the state Senate Fiscal Agency had also had problems getting estimates from the MFO. At a Nov. 7, 2008, meeting of the Michigan Film Office Advisory Council,[*] Michigan Film Office Director Janet Lockwood told Hoekstra that one-third of the movie companies requested that this information stay "confidential." When pressed if there was data available for the other two-thirds, the director replied: "Absolutely. Why don't you call me?" Only one subsequent discussion Hoekstra had with the Film Office offered hope that such a list may have been made available, when the director suggested one of the MFO staff members could compile the information. Further attempts at contact went unanswered and were eventually referred to an MEDC spokesperson. There, the cycle began anew, with assertions that the information Hoekstra requested was confidential because the incentive applications were essentially tax documents. [*] The Michigan Film Office Advisory Council is appointed by the governor to assist and advise the film office in how to best carry out the office's duties. Randy J. Stine, "Movie Magic in Michigan," The Greater Lansing Business Monthly, July 2009. Michigan Film Office, State of Michigan, http://www.michiganfilm office.org/Default.aspx (accessed August 30, 2009). "Public Act 657 of 2006," (Michigan Legislature, 2007), http://www.legislature.mi.gov/documents/2005-2006/publicact/pdf/2006-PA-0657.pdf (accessed August 27, 2009). "Michigan Incentive: Public Acts of 2008," (Michigan Film Office, 2009), http://www.michigan.gov/filmoffice/0,1607,7-248-46457-186660-,00.html (accessed August 30, 2009). "Public Act 77 of 2008," (Michigan Legislature, 2008), http://www.legislature.mi.gov/documents/2007-2008/publicact/pdf/2008-PA-0077.pdf (accessed August 30, 2009). "Public Act 86 of 2008," (Michigan Legislature, 2008), http://www.legislature.mi.gov/documents/2007-2008/publicact/pdf/2008-PA-0086.pdf (accessed August 30, 2009). "Public Act 74 of 2008," (Michigan Legislature, 2008), http://www.legislature.mi.gov/documents/2007-2008/publicact/pdf/2008-PA-0074.pdf (accessed August 30, 2009). "Public Act 75 of 2008," (Michigan Legislature, 2008), http://www.legislature.mi.gov/documents/2007-2008/publicact/pdf/2008-PA-0075.pdf (accessed August 27, 2009). Liz Boyd, "Governor Granholm Signs Film Incentive Package, Sets State for Growing Industry in Michigan," (Office of the Governor, 2008), http://www.michigan.gov/gov/0,1607,7-168-189192-,00.html (accessed July 13, 2009). Eric Gaertner, "Film Incentives Expected to Grow Jobs in Region, State," The Muskegon Chronicle, March 11, 2009. Patrick Affholter, "Lights, Camera, Action: Will Michigan Become the Hollywood of the Midwest?," (Michigan Senate Fiscal Agency, 2008), http://www.senate.michigan.gov/sfa/Publications/Notes/2008Notes/NotesMayJun08pa.pdf (accessed August 24, 2009). David Zin and Suzanne Lowe, "MBT Film Credit Cap: Analysis as Reported from Committee," (Senate Fiscal Agency, 2008), 3, http://legislature.mi.gov/documents/2007-2008/billanalysis/Senate/pdf/2007-SFA-1535-A.pdf (accessed August 27, 2009). Kathy Hoekstra, "The Scene and the Unseen: Act I," (Mackinac Center for Public Policy, 2009), http://www.mackinac.org/articlemedia.aspx?ID=10114#2711 (accessed August 11, 2009).